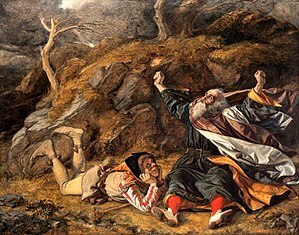 William Dyce - "An Rí Lir agus agus an t-amadán sa Stoirm"
Is dráma traigéide leis an drámadóir clúiteach Sasanach, William Shakespeare, é An Rí Lir ( Béarla: King Lear) a chreidtear a bheith scríofa idir 1603 agus 1606. Meastar é ar cheann dá chuid oibreacha is mó. Tá an dráma Llŷr bunaithe ar an finscéal Llŷr na Breataine, rí Ceilteach réamh-Rómhánach (tá an focal 'Llŷr' díorthaithe ón Cheiltis choiteann *Leros "Muir"). Tá sé curtha in oiriúint go forleathan ar stáitse agus ar an scáileán, agus pearsa an Rí Lir curtha i ngníomh ag go leor d'aisteoirí saoithiúla an domhain. Tar éis na hAthghairme is minic go raibh an dráma athraithe ag cleachtóirí amharclainne, toisc nár thathain a bhéim dhúlagair dhorcha leo, ach ón 19ú haois ar aghaidh, amharctar air mar cheann de sáréachtaí Shakespeare. Tá an tragóid seo aitheanta ach go háirithe faoi a thóraíocht doimhneachta agus a bhreithnithe ar nádúr na fulaingthe agus an ghaoil daonna. Goneril (nó Gonerill), iníon is sine an rí. Regan, dara iníon an rí. Tugadh an leathanach seo cothrom le dáta an 9 Aibreán 2016 ag 16:14.